Dr Paul Barnaby from the University of Edinburgh Library wrote in regarding what (at the time) was a portrait of John Morrison by an unknown artist. Owned by The Stewartry Museum, Paul asked whether this was in fact a self portrait by John Morrison. He pointed out that there is a reproduction of it, credited as a self portrait in Alexander Trotter’s ‘East Galloway Sketches’. He also pointed out the other work by John Morrison on Your Paintings. Group Leader for British Portraits 18th C, David Bindman, was the first to comment agreeing with Paul that the attribution seemed perfectly plausible. Bendor, Group Leader for British Portraits 16th and 17th C also agreed with Paul that this could possibly be a self portrait. Three months or so into the discussion Osmund Bullock wrote in to clarify the execution date of the work. Andrew Greg agreed that Osmund’s argument was very persuasive and the execution date of c.1850 was added. Paul Barnaby also later consulted Trotter’s ‘East Galloway Sketches’ again and found that the self portrait of Morrison reproduced in that volume was painted ‘shortly before his death’, Morrison died in 1853 so c.1850 is feasible. The collection were happy for the PCF to amend the details of the record but still attribute some doubt as they want to check their records again. Altogether this discussion is very convincing. 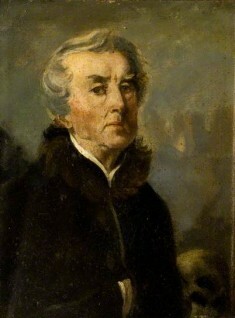 Is this actually a self portrait by John Morrison (1782–1853)?